Today! Sees the kick off of the second year of Jameson First Shot, the filmmaking competition that gives young filmmakers a first shot in the movie business. Back for its second year and running, only in South Africa, Russia and the US, Jameson First Shot have brought the big guns this time! As you may get the chance to work with with acting legend Kevin Spacey in his role as Creative Director, and the chance to direct the incomparable, double Oscar nominated actor, Willem Dafoe in your short film. That's right motherflippin! screen legend WILLEM DAFOE! I am gutted that Jameson First Shot is being held in South Africa, Russia and the US only but stoked that South Africa and Russia, both countries needing as much help in the creative arts as possible are getting the chance to take part in this once in this once in a life time opportunity! I would strongly urge any one interested in getting into film to check Jameson First Shot out - there are few environments that could serve as a better training for film than learning from the people behind Jameson First Shot. I am talking about The man who needs no introduction KEVIN SPACEY! Past his award winning screen acting Kevin Spacey is a serious and generous force across the creative arts and a steer in the right direction from him could be the one break you need. DANA BRUNETTI President of Trigger Street Productions and producer of the upcoming Fifty Shades of Grey, everything he touches turns to gold and did I mention WILLEM DAFOE! Every role that Dafoe plays goes into the big book of great character performances, having him in your short film is a calling card of the platinum variety. Opportunities don't come better than this. Jameson Irish Whiskey is delighted to announce that the short film competition that gives the biggest breaks to talented up-and-comers from the filmmaking world, Jameson First Shot is back for a second year. After the success of the first year which saw more than 5.6 million people worldwide view the three winning films via www.youtube.com/jamesonwhiskey, the competition will aim to discover another three exceptional writer/directors from the same three countries; South Africa, Russia and the USA in 2013. Each winner will once again receive the opportunity of a lifetime to direct a major Hollywood star in their short film with the backing of award-winning production company, Trigger Street Productions. However, in an exciting new development to the competition for its second year, winners will not only get to work with acting legend Kevin Spacey in his role as Creative Director, but they will also get the chance to direct the incomparable, double Oscar nominated actor, Willem Dafoe in their short film. Willem Dafoe is the perfect match for Jameson First Shot; as one of Hollywood’s most accomplished and diverse actors he has played a huge variety of iconic roles; from the Green Goblin in Spider Man to Sgt. Elias in Platoon and Klaus Daimler in The Life Aquatic, arguably making Dafoe one of the preeminent and most versatile actors of a generation. Having starred in more than 80 feature films – from major Hollywood blockbusters to independent film and world cinema, Dafoe’s commitment to his craft will make him an invaluable part of the 2013 competition. Talented filmmakers looking for their big break need to submit a script of no more than seven pages via www.jamesonfirstshot.com by 1 January 2013. Inspired by one of three themes; ‘legendary’ or ‘humorous’ or a ‘very tall tale’, all submitted scripts will be judged by an expert team including Kevin Spacey, Willem Dafoe and Dana Brunetti, President of Trigger Street Productions. The judges are looking for freshness, originality, good structure and above all, a great story. Once all scripts have been submitted, a shortlist will be chosen and each shortlisted candidate will be required to further showcase their flair for filmmaking by submitting a director’s treatment of their script and a piece of footage based on a provided scene from Trigger Street Productions. Once all entries and submissions have been extensively reviewed, the three winners will be chosen – one from each country – with each getting to enjoy a prize like no other as they fly to LA to shoot their script and direct Willem Dafoe in the starring role, all with the backing of Kevin Spacey’s production company. To get a taste of Jameson First Shot, below is 2012's winning South African entry - Alan Shelley's short film Spirit Of A Denture starring Kevin Spacey and Brian Thompson. 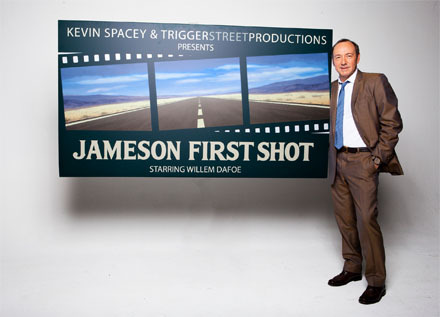 For full details on how to enter plus exclusive videos and tips from Kevin Spacey and Dana Brunetti, visit www.jamesonfirstshot.com.